Experience Ontario Now is the result of a collaboration between Attractions Ontario, Resorts of Ontario, Festivals and Events Ontario, Camping in Ontario and the Ontario Restaurant Hotel & Motel Association. 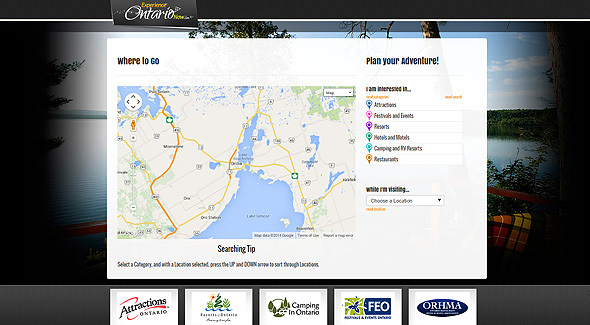 This map based search site allows residents and visitors to Ontario to find leisure experiences, dining and accommodation choices in a select region or all across the province. Custom programming by eCrew brings search results from all five partner databases and presents all the options to the user in one central search web site. This project will also add tremendous value to the five partners and their member businesses, who will benefit from the added traffic to their own web sites as users click for more information.